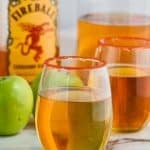 This Fireball Whiskey Punch Recipe is only THREE INGREDIENTS and is perfect for any party! Delicious, and with that amazing Fireball punch! Combine all the ingredients together until the concentrate melts. Optional: Rim the glasses with honey and dip in red sanding sugar.